"A free utility that finds malware and other threats on your Windows PC." 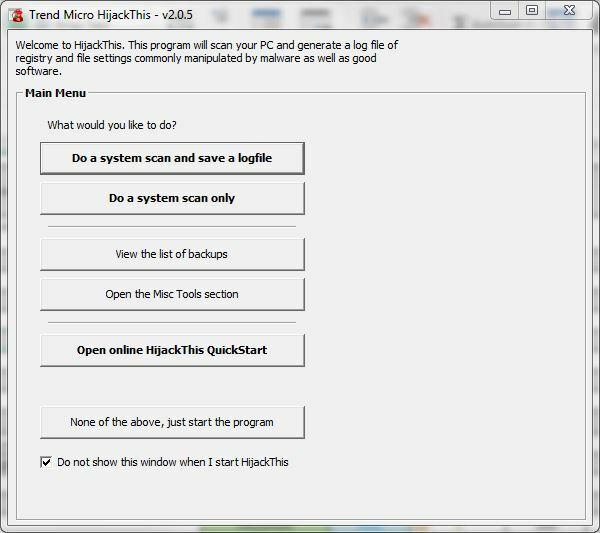 A very well known security application among the virus security community, HijackThis will find just about anything that is wrong with your computer that may or may not be caused by malware or other threats that you may have encountered while you were using the Internet. The application gives you detailed information about the issues that may be present on your PC, and anything that just simply does not look right and triggers a detection. 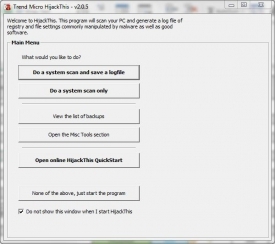 HijackThis will find content that is located in key areas in the Windows registry and on your hard drive(s). The software will generate a report in a text file that you can use for your own reference or for the reference of anyone that is willing to help you fix any issues that you have on your computer. The information given, however, is detailedinformation that will most likely need the eyes of someone that has a good amount of knowledge of Windows and the security aspects of the system. The information may be too detailed for those who do not have much experience in this matter. The reports that are generated are also quite organized and easy to read, which gives this software another reason as to why it has generated quite a bit of respect among its community. The application does not target specific programs or URLs and detects only the methods used by hijackers to force you onto their websites without your approval or, perhaps, even your knowledge as this change can occur from software that you think you can trust. HijackThis is free and can be used freely with a simple download. If you are interested and need the assistants of HijackThis, click on the download link above!